In the Spring ‘18 release, Salesforce has come up with some long-awaited formulas useful for Admins. 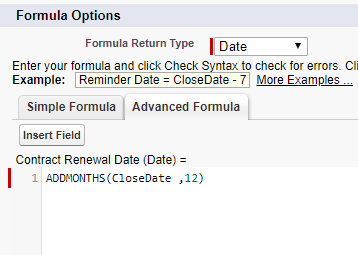 Functions like Addmonths, Currencyrate, Mceiling, Mfloor, and Weekday are now part of Salesforce formula editor. These will definitely make life easier for Admins. Let us go over these new formulas along with some examples. Purpose: Returns the date that is the indicated number of months before or after a specified date. If the resulting month has fewer days than the start month, then the function returns the last day of the resulting month. Otherwise, the result has the same day component as the specified date. Purpose: This formula returns the conversion rate used for a record’s currency code. Example: If you have corporate (Org’s default) currency as USD. But the record’s currency is GBP – you can now retrieve the conversion rate between those currencies and display it as a formula field or use it in reports. The returned value will be a number showing the currency conversion rate, eg 0.717412 (you will be able to control how many decimals are shown). Note:Your arg. Should be multi currency enabled to use this function. Purpose : Rounds a number down to the nearest integer; away from zero if negative. Purpose : Returns the day of the week for the given date, using 1 for Sunday, 2 for Monday, through 7 for Saturday. This formula helps you identify weekend and weekdays. These are welcome additions to add to the power of configuration in Salesforce.